As mentioned in an earlier ICM News article, twospotted spider mites are problematic in droughty years. We recommend scouting corn and soybean fields for mite infestations this year because they thrive in hot and dry conditions. Twospotted spider mites can aggregate at the field edges, especially if there are weeds surrounding the borders. Eventually they can disperse with the wind to develop a field-wide infestation. I encourage people to look at the edge rows first to see if mites can be found. If their presence is confirmed, then estimate populations throughout the field by walking a "Z" or "W" pattern. A few places in Iowa and surrounding states have already reported heavy twospotted spider mite populations with prolonged feeding in soybean (Photos 1 and 2). The first reports of spider mites in Iowa corn have started this week. Photos 1 and 2. Prolonged spider mite feeding in soybean can result in plant discoloration and leaf drop. 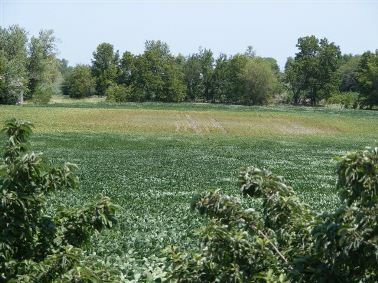 Photos taken on July 6, 2012, in Richardson County, Nebraska by Tracy Cameron. Exact treatment thresholds for spider mites in corn and soybean do not exist. Instead, the decision to treat should take into consideration how long the field has been infested, mite density including eggs, mite location on the plant, moisture conditions and plant appearance. 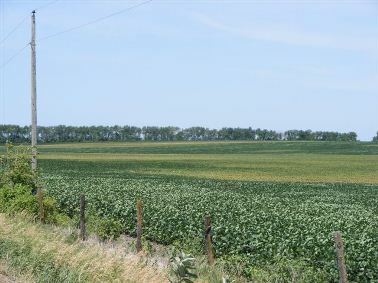 A general guideline for soybean is to treat between R1-R5 (bloom through beginning seed set) when most plants have mites, and heavy stipling and leaf discoloration are apparent on lower leaves. Foliar insecticides are recommended in corn from R1-R4 (silking through dough stage) when most plants have mites at or around the ear leaf and 15-20 percent leaf discoloration. Organophosphates are the recommended insecticidal chemistry to manage spider mites (e.g., chlorpyrifos or dimethoate). Follow label directions and pay attention to application guidelines and preharvest intervals. Remember these products do not kill eggs, so continue scouting after an application to evaluate product efficacy and residual. To improve application coverage, consider increasing the water volume to make contact with spider mites. Border treatments may also be a cost effective option if heavy spider mite populations are restricted to edge rows. Erin Hodgson is an assistant professor of entomology with extension and research responsibilities; contact at ewh@iastate.edu or phone 515-294-2847. Links to this article are strongly encouraged, and this article may be republished without further permission if published as written and if credit is given to the author, Integrated Crop Management News, and Iowa State University Extension and Outreach. If this article is to be used in any other manner, permission from the author is required. This article was originally published on July 9, 2012. The information contained within may not be the most current and accurate depending on when it is accessed.